CLASS GIFT: WE DID IT! What is the Class Gift? !! Happy New Year Class of '68!! May the New Year be one of Health, Love, Laughter, and Bright Possibilities!! 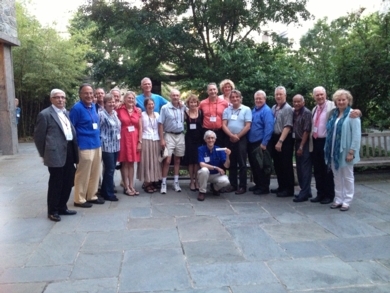 POST YOUR REUNION PICTURES, MEMORIES, REFLECTIONS. CLASS GIFT: WE DID IT! AND WE DON'T HAVE TO STOP HERE! 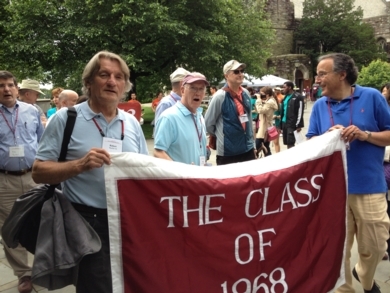 Welcome to the Swarthmore Class of 1968 website!! Remember these folks? 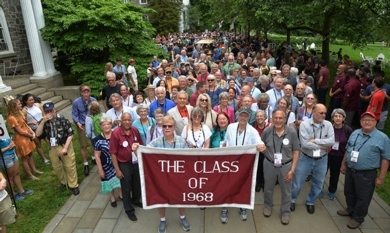 There are more pictures like these on the Past Reunions - 45th Reunion page and the S'more Photos/Art/Pix Gallery - 45th Reunion page. And you may have a close-up! If you haven't yet logged on, go to First Time Visitors on the panel to your left and follow instructions for logging on/registering. Once you're on the site, you can create a profile for yourself under the Classmate Profile site - third "button" down on the left panel. When you find your name and click on it, your profile will come up. Click on "Edit Profile" to begin the process. You will find your Halcyon picture on the 1968 Halcyon site half way down the list on the left. 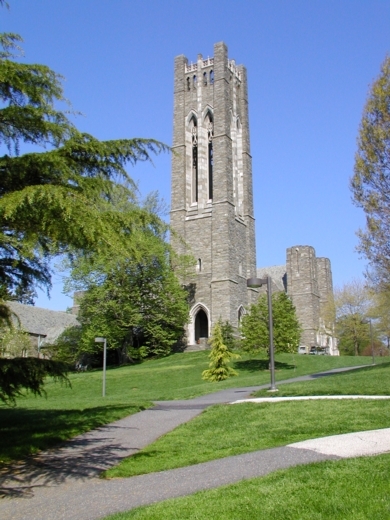 Those who graduated in 1969 will find a link to the 1969 Halcyon as well. And your Cygnet picture, on the 1964 Cygnet page underneath. I will be happy to help you retrieve and download and then upload those pictures to the site. If you have a recent picture in a file that's easy to get to, put your cursor over the picture frame where you'd like it to go on your profile and click on "Select Picture." Go to the picture file you want and open it. Follow instructions. Be patient. Sometimes the site is slow and the little circle will wheel around for a bit before your picture is completely uploaded. The Class Gift proposals are listed in an index under Class Gift Proposals. Each proposal is presented at greater length which you can access with the dropdown menu. There is a general Class Gift discussion forum and individual discussion forums for each proposal under the Class Gift Discussion Forums on the left. Go ahead. Poke around. You can't break anything. Email me with questions. Send feedback that would be helpful for those who will come after. Good luck and have fun. It's a brave new world in here.